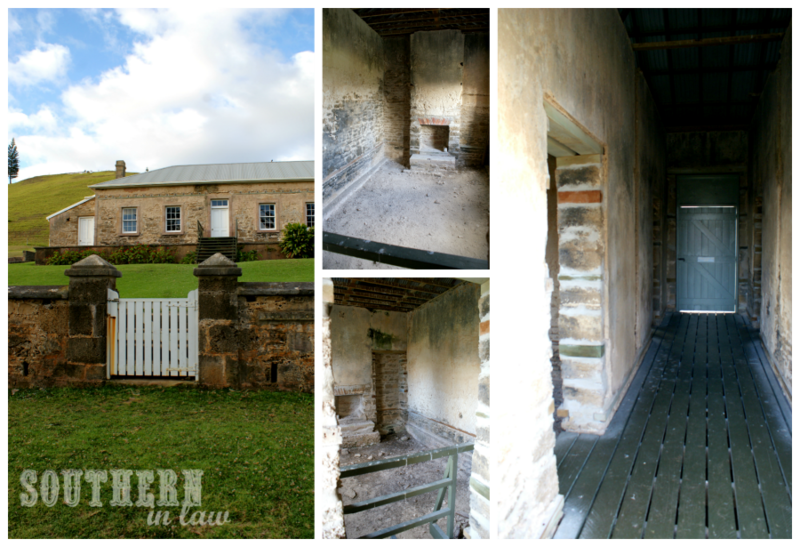 Find all of the posts from our Norfolk Island Adventures here. Vacation, holiday; whatever you choose to call it, a break away from every day life always sounds like heaven. This past weekend, Jesse and I switched off and escaped to beautiful Norfolk Island for what may just be one of the most relaxing vacations we've had in a long time! Even better, it was a SAFE vacation for this allergic-to-everything-girl and I am so glad to share this coeliac safe holiday destination with you! But we don't simply want to tell you about our trip, we want to show you! 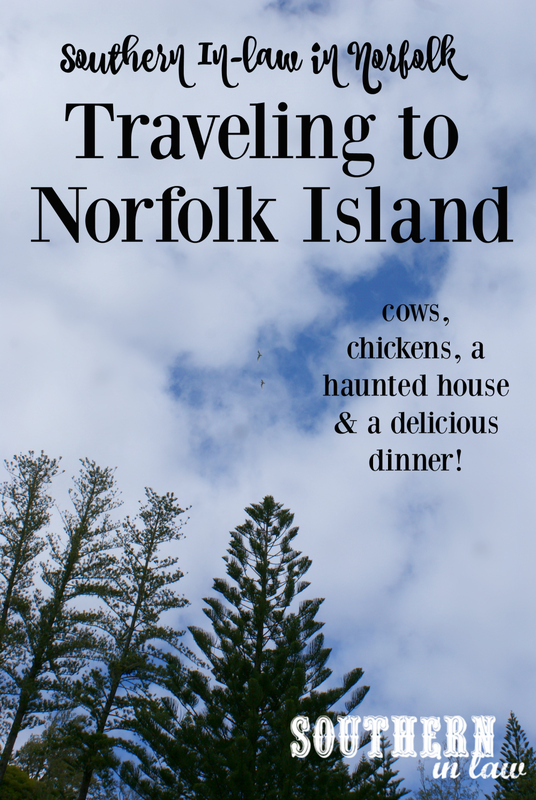 Norfolk Island here we come! Our vacation started early on Friday morning. Our bags were packed, we quickly gobbled down some breakfast and jumped into the car ready to head to the airport. We were flying with Air New Zealand to Norfolk Island on a quick 2 hour and 25 minute flight. 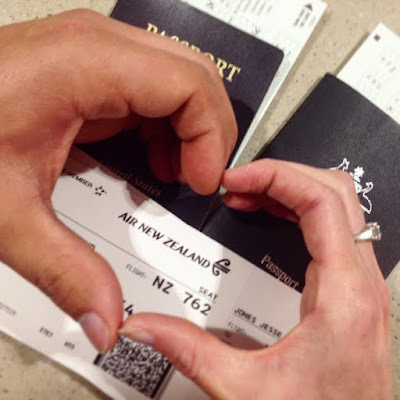 We checked in using Air NZ's handy self serve counters, dropped off our bags and filled out our departure cards before heading through customs to wait for our flight. Yep, you read that right! 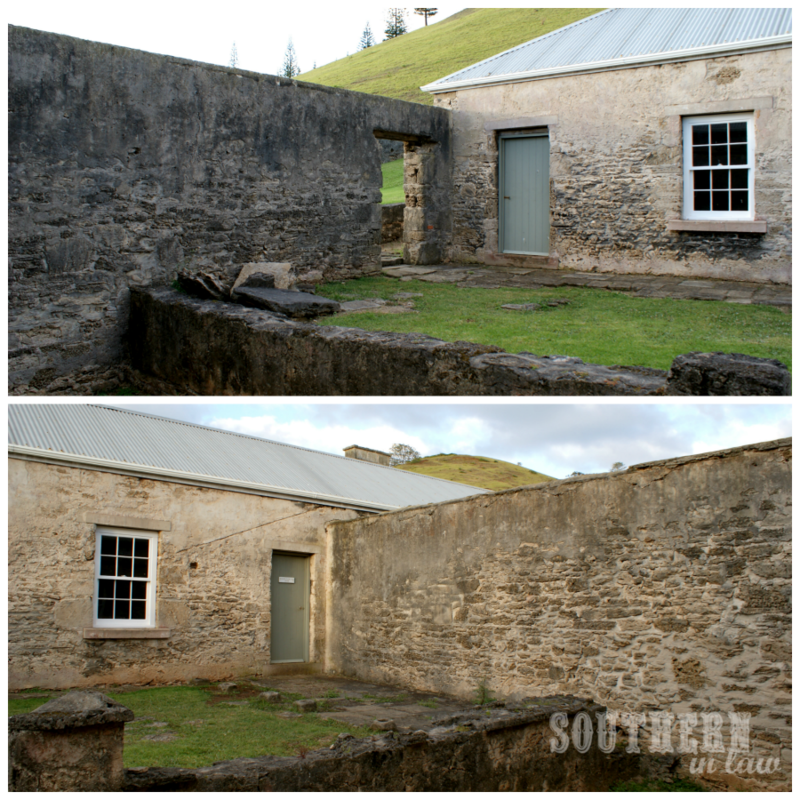 Norfolk Island is actually considered an international destination, even though it is an "external territory" of Australia. When travelling to Norfolk you will need your passport, as well as a valid Australian multiple-entry visa if you're not a citizen/resident. Tip from us: Don't be silly like us and put the country you're visiting as "Australia" on your departure card (even though Norfolk Island is technically part of Australia). Instead, put Norfolk Island; otherwise cranky customs officers will look at you like you're an idiot. 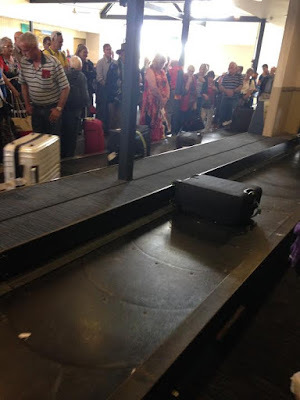 Once we passed through customs, we headed to our boarding gate to wait for our flight. We had an hour or so to spare so we sat, chatted and read until it was time to board! We were flying to Norfolk Island with Air New Zealand aboard their Airbus A320. A comfy plane with two three seat sections per row with an aisle running down the middle; seating around 150-180 passengers per flight. 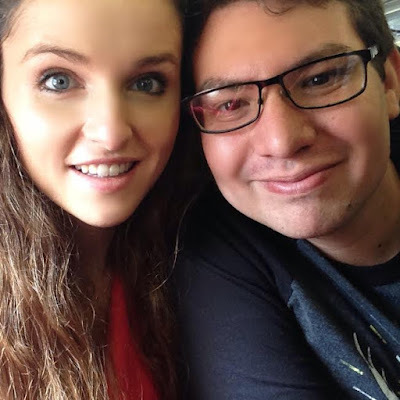 On the plane and ready for take off! The flight to Norfolk Island is a relatively quick one, taking only 2 hours and 25 minutes, and the time really does fly (pardon the pun!) by. A light lunch is served on board with a choice of a hot or cold lunch or a preordered special meal (including vegetarian, gluten free etc). 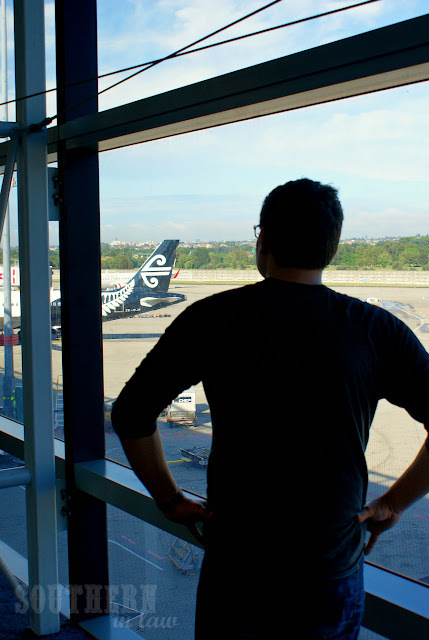 Air NZ give you a choice of flight options to tailor the experience to you. Giving you the option to purchase just a seat (meaning you only have carry on luggage), a seat + bag, "the works" package (seat + 1x checked bag + meal & drinks + inflight entertainment) or "the works deluxe" (seat + 2x checked bags + meal & drinks + inflight entertainment + premium check in/boarding/baggage + guaranteed free seat next to you). All seats on the A320 have screens on the back of each chair, meaning every passenger can choose to watch a movie or tv show, listen to music or play games, however, content is limited for those on a seat/seat + bag package. The best part about flying with Air NZ though? The safety videos! If you think I'm kidding, you really need to watch the video above as Air New Zealand really know how to get every passenger to pay attention to safety instructions! They created the above video in partnership with Sony Productions and it is so good! Our first glimpses of Norfolk! 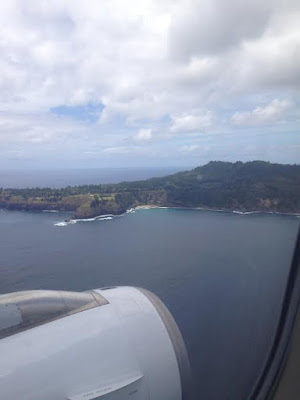 Before we knew it, we were getting ready to land and we could see Norfolk Island from the windows of the plane! Once we touched down in Norfolk, we headed down the stairs of the plane to the island's teeny tiny airport to wait for our bags and pass through customs. Jesse was totally amused by the island's airport. The passengers from our flight crammed into the tiny little arrivals terminal room to collect their baggage and pass through customs. Whilst it might look a little daunting, the whole process took us less than 15 minutes - even with food to declare (because we all know a coeliac's bag probably contains more food than clothes). 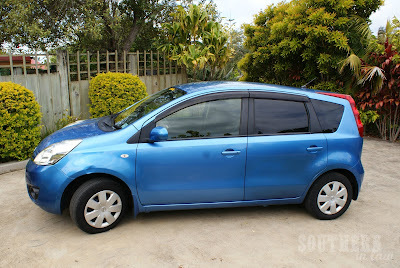 Little beep beep - our ride for the weekend! 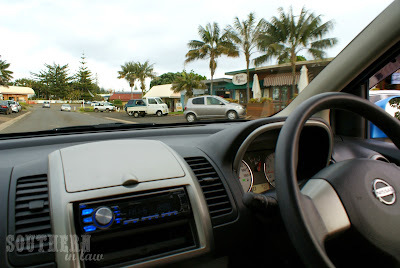 We left the airport and got our first taste of how different things would be when we picked up our hire car from Aloha Rent-a-Car. "When you bring the car back to the airport when you're leaving, just leave the keys on the floor"
Jesse looks at the guy with a puzzled look on his face... "the floor? like... the floor of the car? Do you want me to hide them or anything?" "No mate, just put them on the floor of the car where I can see them - or leave them in the ignition even". We were even more confused now, this definitely wasn't something you could do in Sydney - but the guy explained that Norfolk Island is actually so safe that no one locks their cars - and most people even leave the keys in the ignition! You see, you can't really steal a car on an island that's 34.6 square kilometres (13.3 square miles) in total. We drove out from the airport in our, affectionately named, little beep beep; ready to check in to our beautiful home away from home; Tintoela's Kushu Cottage. But I'm not going to tell you about Kushu yet as the cottage deserves a post of it's own! After checking in and dropping off our bags, we headed out to explore the island; guided by an easy-to-use map you can pick up at the Tourist Information Centre (located on Taylors Road; the main road in town). It wasn't long before we met our first cow on the island. 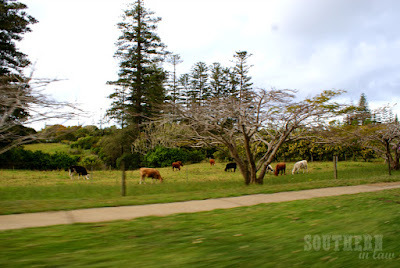 You see, on Norfolk Island; cows have right of way. 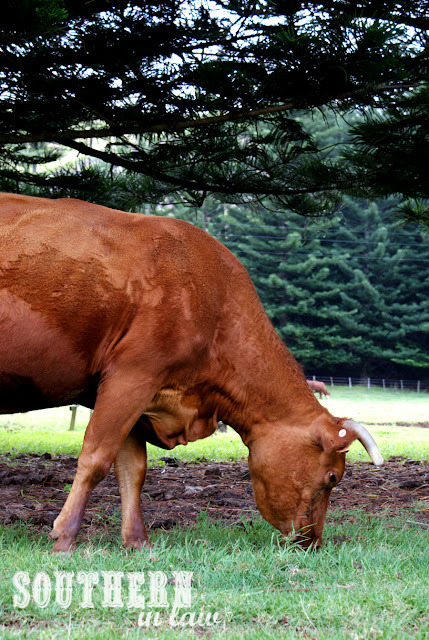 Owners of cows on the island are allowed to have (from memory!) 10 cows roaming free on the island, with the rest kept in their paddocks. The cows have free roam of the island, with the exception of the main road (cattle gates can be spotted around the island to stop cows going where they shouldn't!). If you're worried about that, don't be! The only cows you'll see roaming the island are the female ones - they're more than happy to plod along and mind their own business - whilst the feistier bulls are kept in their pens. As well as cows, you'll see lots of feral chickens. Yup, feral chickens. They're a bit of a pest on the island and you will see them everywhere - as well as hear the roosters crow. 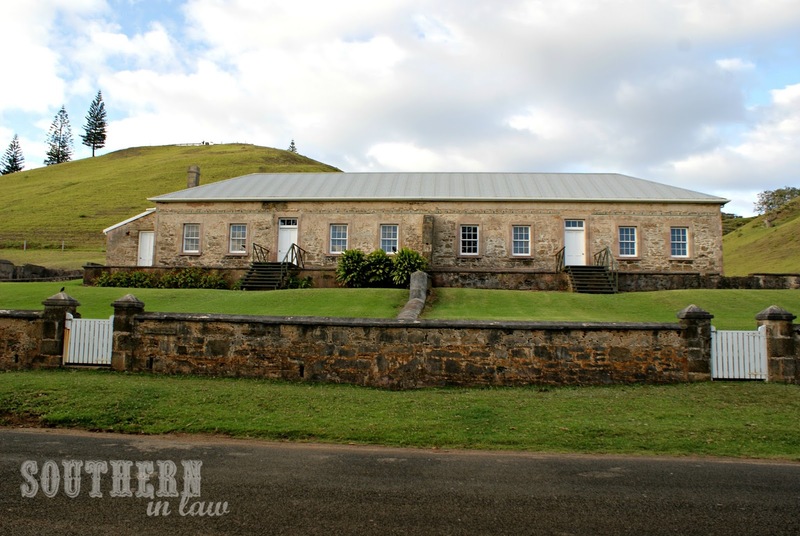 Whilst Norfolk Island doesn't have any native mammals on the island, they have plenty of birds! 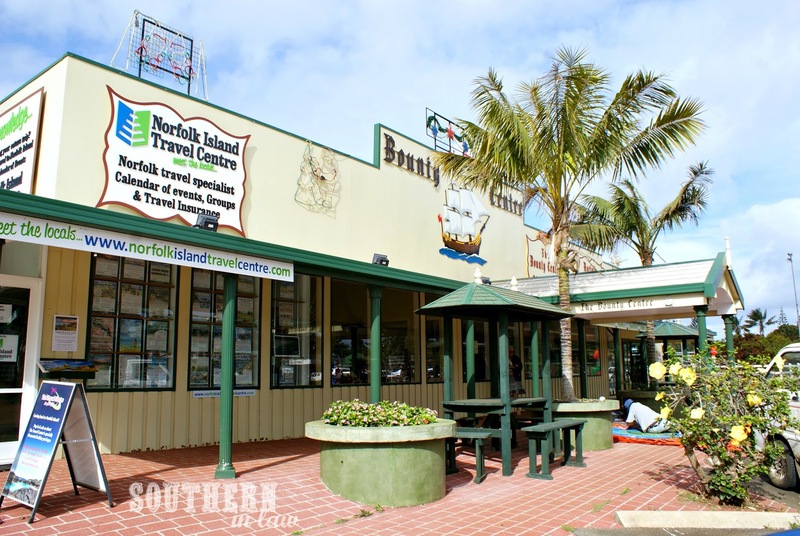 The island is home to over 20 different species of birds, including seabirds like booby birds and terns to forest birds like the rare green parrot, owls, kingfishers and robins as well as introduced species like rosellas and the feral chooks! Whilst we did explore the island for quite some time, I want to save those photos for a separate post so I can tell you more about them! As well as exploring the island, we also visited some of the local shops; including the incredible Bounty Centre - the island's toy shop which has an impressive collection of toys! 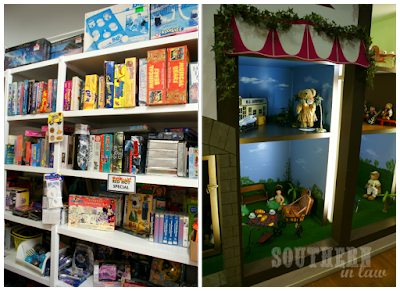 The Bounty Centre is filled with just about every game, toy and teddy you could imagine! We could have spent hours browsing through the shelves and we walked around wishing we'd brought an extra suitcase! The Bounty Centre has exceptional prices - and really does have some of the cheapest lego toys you can find! If you're a board game lover or have kids, this is one shop you cannot miss. We picked up two puzzles as well as a bunch of different knick knacks to bring home with us before heading back to the cottage to get ready for dinner! Dinner for our first night was at Dino's Restaurant; just 10 or so minutes from our cottage in Cascade. Dino's is located in Bumboras, tucked away on the southern end of the island. 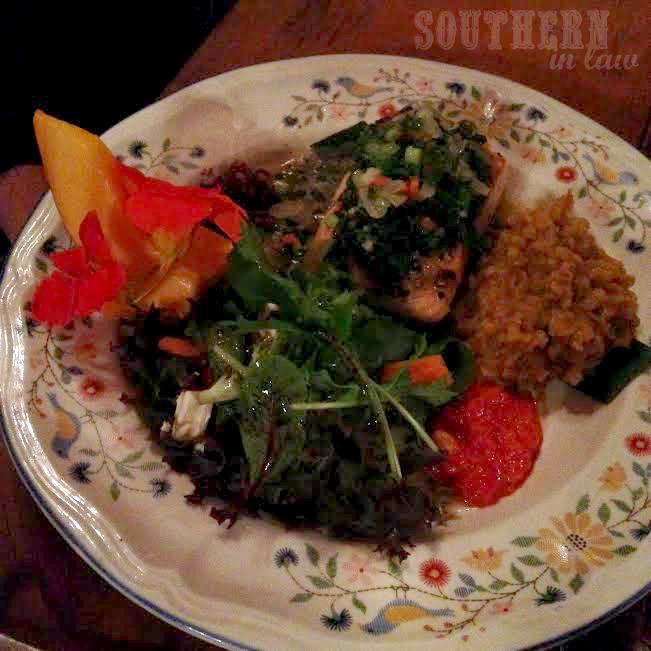 The restaurant is actually inside a beautiful island home, owned by chef Dean and his wife Helen. The home is absolutely beautiful and filled with interesting art pieces. The walls, floors and ceilings are all made from beautiful Norfolk Pine and the property is nestled amongst one and a half acres of beautiful gardens; including veggie patches and fruit trees which supply them with lots of the produce served up on the restaurant's tables. If you're wanting to eat at Dino's, you definitely need to book ahead as it's a favourite of both locals and visitors. The restaurant has a small but delicious Italian inspired menu featuring local produce, all served up by warm and welcoming staff. Jesse and I enjoyed dinner with Tania and Trina from Norfolk Island Tourism, as well as James and the crew from Weekend Sunrise who were also in Norfolk for the weekend. 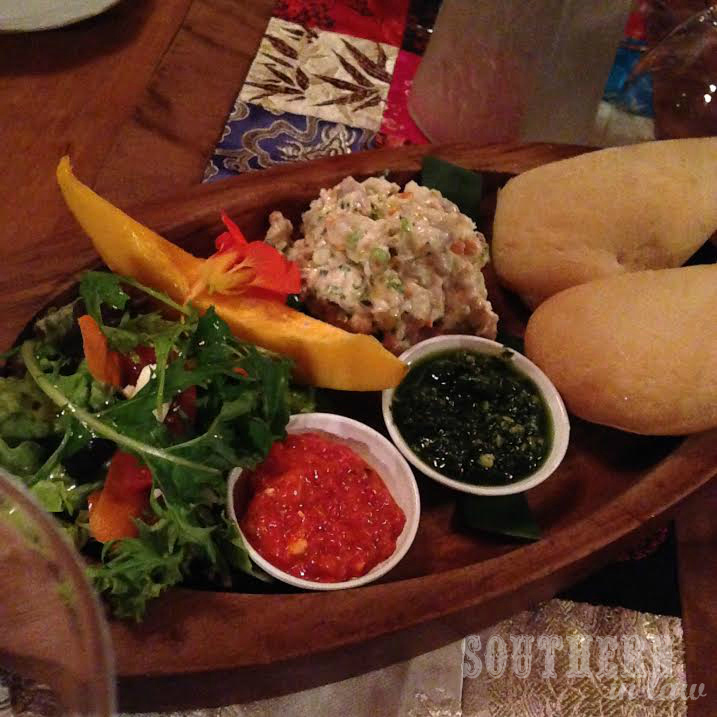 We started the meal with the day's special entree; local kingfish pate served on crusty bread. Everyone around the table loved it and it was gobbled up in minutes. If you're a coeliac like me, don't worry! Dino's is incredibly coeliac friendly (and allergy friendly) and is more than happy to make the changes needed to accomodate for your needs. Next up was our mains and Jesse and I both went for the beef. Jesse had the Beef Scotch Fillet served with Garlic King Prawns, Roasted Rosemary and Garlic Potatoes and a Greek Salad from the menu whilst the allergy queen enjoyed the beef scotch fillet with steamed vegetables, picked fresh from the garden. 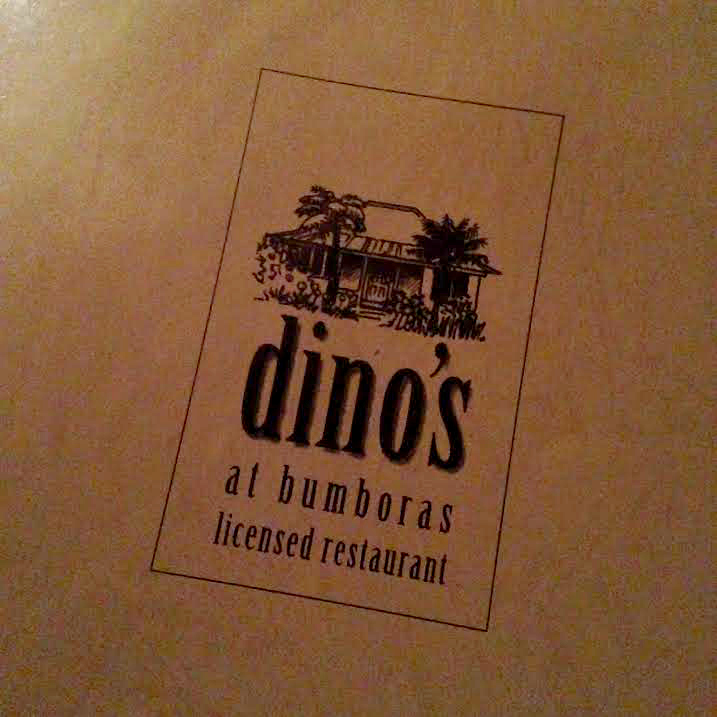 I was incredibly impressed with Dino's as they not only delivered delicious food - they delivered it safely - checking with me to make sure each ingredient was safe and even coming out to check if salt and pepper was okay before seasoning the steak. 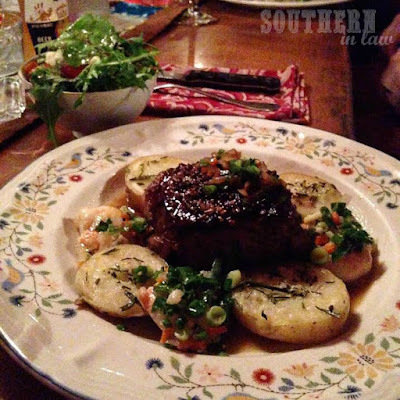 The steak was tender and juicy and the vegetables were so full of flavour I was actually thankful for my allergies. When vegetables are in season and freshly picked, you really don't need to do much to make them shine - I only wished I could have had an entire bowlful because they were so so good! We both ate every last bite - and so did the rest of the table! Other dishes on the menu enjoyed by our dining companions included; Seared Tasmanian Salmon with a Salsa Verde Crust, served with a Lemon Shallot Butter Sauce over an Orange and Cardamom Dahl, the Roasted Lamb Rump Salad served with Flat Bread, Baba Ganoush and Hummus with a Lemon Yogurt Sauce and the Marinated and Roasted Pork Scotch Fillet in a Capsicum Relish with a Walnut, Mandarin and Honey Sauce served over pan fried Spring Vegetables. For dessert, Wayne ordered the Chocolate Mousse Cake for the table to share as a bit of fun and my oh my was it a bit of fun. As one of the gluten free options on the menu, I happily tried it and I have to say - if you're heading to Dino's Restaurant and you're a chocolate lover; leave room for dessert. After dinner, Jesse and the boys decided it would be fun to head down to Kingston to visit what the locals know as one of the most haunted places on the island; The Duplex. 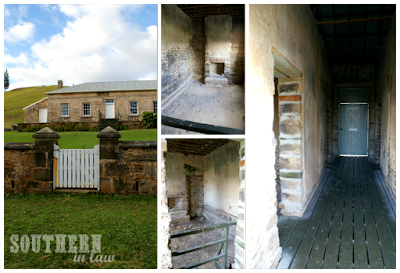 The Duplex is a heritage listed ruin which looks perfectly normal from the outside, however, once you open the front door (with a hard budge, might I add! ), you're met by ruins. A hallway runs through the middle, leading to four small rooms and an external door at the back. The rooms are blocked off by baricades and whilst I was too chicken to go in at night, I came back during the day to take some photos for you all. Once you walk through the external door, you're met by another building with more rooms. Just like the front of the building, this too has had doors, windows and a roof added to the ruins. Jesse, Trina and the Sunrise Crew didn't see any ghosts or get any cold shivers, however, I was just worried that sticky door was going to trap me inside so I happily snapped and got my way back to the car! After dinner and the brief ghost tour, we headed back to beautiful Tintoela (which I'll show you soon!) where we promptly crashed. After being up since 5:30am, a comfy bed was exactly what we needed before a busy weekend ahead! Stay tuned for more of our adventures in some upcoming posts! But tell me, have you ever been to a haunted/derelict old house at night? Or are you a bit of a chicken like me? Kristy and Jesse travelled and explored Norfolk Island as guests of Air New Zealand and Norfolk Island Tourism. To find out more about our travel posts & opportunities contact us here.